Hypocalcemia, a condition characterized by abnormally low levels of calcium, can have an adverse effect on a number of different body systems including circulation, muscles, nerves, and bone. Without adequate calcium, blood has difficulty coagulating, the heart may skip beats or stop beating altogether, muscles may have difficulty contracting, nerves may have difficulty functioning, and bones may become brittle. The causes of hypocalcemia can range from hormonal imbalances to an improper diet. Treatments vary according to the cause, but prognoses are generally good. Conversely, in hypercalcemia, a condition characterized by abnormally high levels of calcium, the nervous system is underactive, which results in lethargy, sluggish reflexes, constipation and loss of appetite, confusion, and in severe cases, coma. Obviously, calcium homeostasis is critical. The skeletal, endocrine, and digestive systems play a role in this, but the kidneys do, too. These body systems work together to maintain a normal calcium level in the blood ([link]). When all these processes return blood calcium levels to normal, there is enough calcium to bind with the receptors on the surface of the cells of the parathyroid glands, and this cycle of events is turned off ([link]). 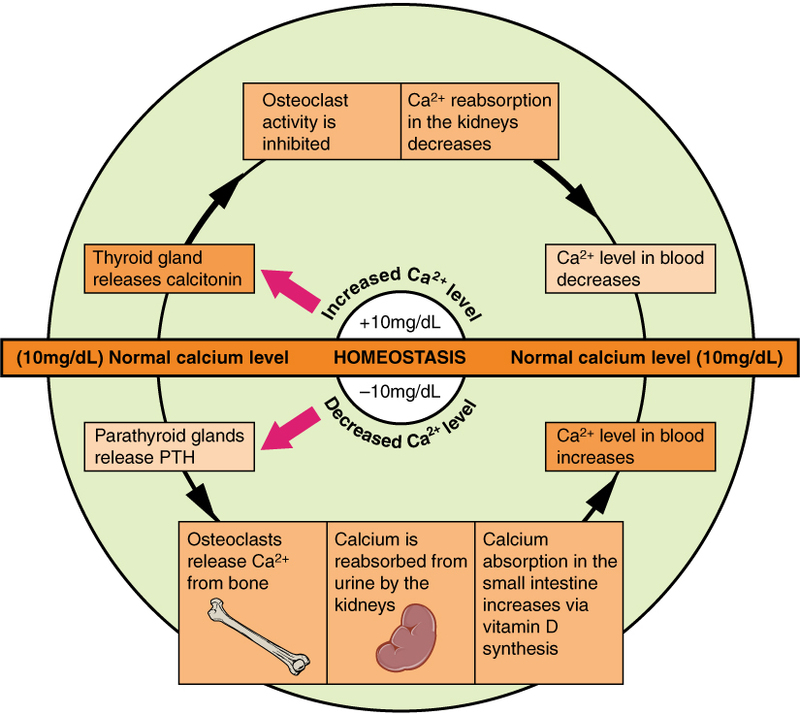 When blood levels of calcium get too high, the thyroid gland is stimulated to release calcitonin ([link]), which inhibits osteoclast activity and stimulates calcium uptake by the bones, but also decreases reabsorption of calcium by the kidneys. All of these actions lower blood levels of calcium. When blood calcium levels return to normal, the thyroid gland stops secreting calcitonin. When calcium levels are too high or too low, which body system is primarily affected? Which of the following is most likely to be released when blood calcium levels are elevated? An individual with very low levels of vitamin D presents themselves to you complaining of seemingly fragile bones. Explain how these might be connected. Vitamin D is required for calcium absorption by the gut. Low vitamin D could lead to insufficient levels of calcium in the blood so the calcium is being released from the bones. The reduction of calcium from the bones can make them weak and subject to fracture. Describe the effects caused when the parathyroid gland fails to respond to calcium bound to its receptors. Under “normal” conditions, receptors in the parathyroid glands bind blood calcium. When the receptors are full, the parathyroid gland stops secreting PTH. In the condition described, the parathyroid glands are not responding to the signal that there is sufficient calcium in the blood and they keep releasing PTH, which causes the bone to release more calcium into the blood. Ultimately, the bones become fragile and hypercalcemia can result. Calcium Homeostasis: Interactions of the Skeletal System and Other Organ Systems by OpenStaxCollege is licensed under a Creative Commons Attribution 4.0 International License, except where otherwise noted.